What makes Goncalo Alves wood an alternative to Ipe? Because Ipe is the premier decking species, hands down, all other quality decking choices can be considered Ipe alternatives, because if money were no object, we’d recommend Ipe to everyone. Since affordability is often a concern, though, many other tropical hardwoods are excellent choices. Tigerwood may be one of the few that we would understand even our least financially confined customers choosing over Ipe, due to its distinctive appearance. True to its name, Tigerwood has a brownish orange base color with dark stripes, similar to that of a tiger. The orange hue darkens over time to a deeper reddish brown. Even still, this eye-catching species has a lot more to offer than looks. Tigerwood, or the Goncalo Alves tree, grows in South American nations such as Brazil, Guatemala, and Peru, as well as in African nations such as Nigeria, the Democratic Republic of Congo, and Sierra Leone. Plantation-grown options also exist, making it a highly sustainable, or green, lumber species, despite its troubled history. The overharvesting that once led to African deforestation has given way to more responsible harvesting in South America.In addition, over-logging of the African variety is made difficult by export restrictions; of course, such restrictions also ensure that Tigerwood remains a higher-end species. The Tigerwood tree not only is harvested for its excellent lumber, but it also produces abundant nuts that are similar in flavor to hazelnuts; uses include being ground into flour or used as cooking oil. Because Tigerwood dries well, it is quite stable in most climates. However, kiln-drying is necessary to achieve optimum stability. This species is highly water and insect resistant, making it a long-time favorite for railroad ties and bridge pilings. Of course, the visual appeal makes it also a favorite for furniture and cabinetry as well as for hardwood veneers. Increasingly popular for both interior flooring and decking applications, Tigerwood’s unique appearance is a challenge for those hoping to attain a consistent appearance but a major plus for those looking for a distinctive look. Its smooth texture feels great on bare feet but can lead to slippage issues. Sometimes people confuse Tigerwood trees or lumber for Zebrawood. 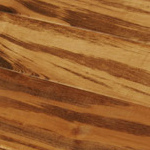 Native to Brazil, Zebrawood has a darker heartwood that appears dark brown or black. The sustainability issues of Zebrawood are similar to older issues related to sustainability with Tigerwood. J. Gibson McIlvain fastidiously checks out all our partner mills and ensures that an untainted supply chain is in place. Our quality control process is also second-to-none. Since we ensure both environmentally and socially responsible practices and the highest quality lumber available, we offer our customers a unique opportunity. With a wide variety of hardwoods, softwoods, hardwood plywood, and custom millwork available, we provide an additional opportunity for one-stop shopping that helps you save on shipping and valuable time and run-around.